Take advantage of in-season asparagus this spring and savour its flavour in a delicious and smooth, creamless cream of asparagus soup. In a large pot, melt the butter over medium-high heat. Saute the onions, garlic and celery until the onions are soft and translucent. Add the potatoes and asparagus and mix well. Add the chicken (or vegetable) stock. Bring to a simmer. Turn the heat down to low and continue to simmer for about 15 minutes, until the vegetables have become soft. Puree the soup in batches using your blender and pour it back to the pot. Add the lemon juice and black pepper and stir to mix. On low, continue to cook for a couple of minutes, stirring occasionally. 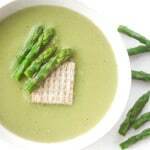 Serve hot with crackers and asparagus tips on top. Cook the tips in boiling salted water for about 4 minutes they are slightly tender. Drain and serve on top of your bowl of soup.